Following the introduction of V2G technology, our innovative efforts did not stop there. Our focus remained not only on how renewable energy is produced, but also how it can be stored. In addition, factoring in accessibility and efficiency were integral in our technological efforts. V2X (vehicle-to-everything) technology emphasizes availability and accessibility. With a smaller size, lighter weight, and simpler installation process, V2X charging technology is ideal for homeowners and office solutions, fit with ease of installation. To create V2X charging technology, we collaborated with our partners eNovates and PRE Power Electronics (PRE), working tirelessly to provide charging solutions that benefit renewable energy sources as a whole. PRE’s robust experience in perfecting rapid charging services made them the ideal partner to work alongside with. With eNovates, an organization specializing in combining hardware and ingenious software solutions, we were able to possess the necessary resources to craft an innovative and never-before seen bidirectional charging solution. What is the difference between V2G and V2X? V2X can be best described as encompassing aspects of V2G with added benefits. The main differences between V2G and V2X is accessibility and efficiency. V2G chargers, while serving their purpose, are extremely large. As a result, installation processes were not as simple and the resources needed to install were vast. With V2X charging, we eliminated this inconvenience and made the charger far more accessible to all kinds of drivers. The V2X charger is now characterized by its small size and lightweight, making the device more suitable for easy installation at private homes, offices, and many other locations. In addition, the response time of changing the charging direction has increased significantly, making the V2X superior in terms of energy efficiency. 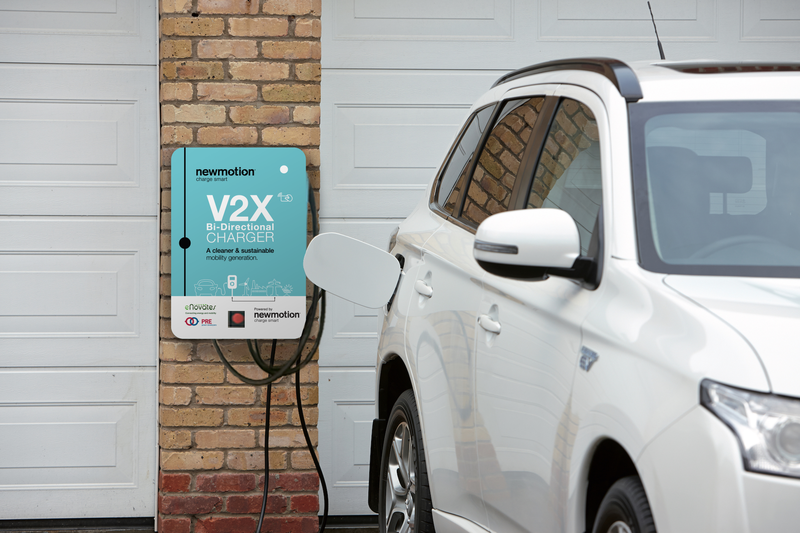 Our V2X charging system is the first of its kind that you can simply hang in your garage, storing energy back into the home or office grid. In addition, using our app interface, you gain access to insights into charging sessions, behaviour, and other important information. The accessibility of the V2X bi-directional charger is integral in making it a household name capable of being used in any setting. V2G-technology works through specially designed bi-directional charging stations. These charging stations allow electric vehicles owners to charge their cars whilst also facilitating the discharge of the vehicle's battery. The pilot has been launched to test the viability of discharging electric vehicles to help balance the supply and demand within the electricity grid. The popular Mitsubishi OUTLANDER PHEV is the first car in the Netherlands to balance the Dutch energy network using V2G-technology. Every Mitsubishi OUTLANDER PHEV and its battery already having the capability to utilize a V2G charge point. The Mitsubishi Outlander PHEV, with its 12 kilowatt-hour battery, stores as much energy as the average family consumes in one day. As a Vehicle Owner - What could this mean for me in the future? There is inherent system value in offering the flexibility of an EV battery. The pilot aims to investigate how individuals can not only make an obvious contribution to the environment by reducing CO2 emissions, but also earn money - marking the start of a real energy revolution in the field of electric driving. Electric vehicles can help support the balancing act between electricity demand and supply by adjusting their charging levels second-to-second in order to maintain a steady voltage and frequency. Taking advantage of this power will require new market rules, but the majority of electric vehicles could provide valuable services to the grid, and are often able to respond more quickly than existing power sources. By drawing power from the grid during the midday hours when solar output is greatest, electric vehicles can soak up the sun-generated power and in turn reduce the evening ramp-up by returning power to the grid. If vehicle owners have access to charging at home and at work, over 70% of vehicles are available to absorb excess daytime electricity generation.. The chart illustrates how charging these vehicles between 11 a.m. and 4 p.m. and discharging at peak times would help smooth the rise in demand, giving grid system operators more time to accommodate increasing electricity consumption. By joining forces with Mitsubishi, and grid operator TenneT, we tested the implementation of our bi-directional chargers in order to understand how electricity can be better balanced and redistributed into the network. Our aim with this pilot project was not only to encourage the use of renewable energy sources but to introduce an earnings model for electric drivers. By harnessing the energy sources that are electric vehicles, owners can make a significant contribution to their environment by reducing CO2 emissions while also potentiall giving back to their energy suppliers. NewMotion's CEO Sytse Zuidema calls it "an energy revolution in the field of electric driving." In further testing of our V2G technology, we installed the world's frst public charge points cabaple of delivering electricity back into the grid. Alongside our partners, this pilot project put our technology to the test and delivered conclusive results. This pilot was run alongside the City-Zen programme which aims to create more effective and energy-efficient cities throughout Europe. For this pilot, we utilized public charge points located around Amsterdam including office locations at PwC and a sports facility. By working with these various entities on this project, we tested V2G technologies in different types of locations in order to understand the contribution that this technology can make to sustainable and energy efficient cities. What does V2G technology entail? Vehicle-to-Grid (V2G) technology enables the EV to both charge and discharge electricity back to the grid. This is done by using a special type of charge point capable of AC / DC power conversion and the discharge functionality of the car. Both the direction and speed of the charging power can be remotely controlled by NewMotion via the charge point. This is the basis for the provision of any energy system related service (peak shaving, PV integration, voltage control, etc.).. One of those services is the real time balancing of demand and supply based on the grid frequency (50 Hz). V2G power control effectively turns an EV into a stationary battery, which can provide this service during the time the EV is parked and connected to the charge point. By aggregating or pooling together multiple EVs we can create a ‘virtual battery’ which can deliver these grid services on a larger, nationwide scale. This delivery of grid services supports the overall adoption of renewable energy sources such as solar and wind. Since these are intermittent and thus more volatile than traditional energy resources (such as gas-fired power plants) they need to be complemented with backup capacity. A large scale virtual battery of EVs can provide that capacity and in doing so decrease the need to keep traditional power plants running just for that purpose. What is the difference between regular ‘smart’ charging and V2G? The main difference of V2G in comparison to regular smart charging (‘V1G’, unidirectional, from grid to EV) is the discharge functionality. By having the option to discharge it is possible to avoid a situation where the full battery limit is reached and the car just sits there idle. This creates a significant increase in flexibility per EV and a better integration with the local grid. What is the benefit for the end-users? Using EVs to provide system services is valuable for different stakeholders in the energy system such as transmission system operators and energy market parties. Part of this value can be shared with the end-user and in doing so the total cost of ownership can be minimized. This can be done both from a driver as well as charge point owner perspective. The goal is to gain value while retaining user friendliness of the solution, i.e. there is no additional impact for the end-user compared to normal charging. What do end-users need to make use of V2G charge points? For now we only engage 10 pilot customers with a CHAdeMO enabled EV (e.g. Mitsubishi Outlander or Nissan Leaf). Charge points are placed in both residential and office areas. Apart from the size and the CHAdeMO cable, the charger acts just like a regular charger activated by a charge card. Both the card and the charger have to be registered for the ‘V2G Service’. Additional (web)app functionality is provided so the user can enter his/her time of leave and overrule the V2G Service when necessary. The app also will provide feedback about the session and the potential earnings. What is the goal of this pilot? The goal is to demonstrate a real life implementation of the V2G technology in combination with the delivery of Frequency Control Reserve (FCR) to TenneT. In this way NewMotion gains insight and experience in user interaction, system value, charger technology, aggregation, battery impact, etc. What does this technology do to the battery of the Outlander? There is currently no consensus on the impact of V2G charging to the battery. Research literature leans towards no impact, some even state it can have a positive effect. During the pilot battery measurements are taken from the car at the beginning and end of the project to give more insight. When will this technology be ready for other car models? V2G charging in this pilot is based on the CHAdeMO protocol (Japan based standard deployed by Mitsubishi and Nissan) and the power enters the car as DC, similar to fast charging. In the future we might see different implementations based on AC charging, or the CCS (DC) standard. What is already installed now and what will happen in the future? We will install 10 V2G chargers before the end of 2017. The FCR part of the pilot runs until at least March 2018.